This article is part of special IPS coverage for World Environment Day, on June 5, whose theme this year is “Beat Plastic Pollution”. RIO DE JANEIRO, Jun 3 2018 (IPS) - Although Latin America produces just five percent of the world’s plastic, it imports billions of tons annually for the use of all kinds of products, some of which end up in the sea as garbage. It thus contributes to this kind of artificial tsunami that threatens the biodiversity of the oceans, where 13 million tons of waste, mostly disposable plastics, are dumped each year at a global level, according to UN Environment – enough to wrap around the Earth four times. The impact is such that it also affects human health, as this resistant waste enters the food chain, and has led the United Nations to declare “Beat Plastic Pollution” as the theme for this year’s World Environment Day, on Jun. 5. Favoured by a 3,000-km coastline on the Pacific Ocean, with one of the world’s most nutrient-rich waters, Peru was one of the first Latin American countries to join the Clean Seas campaign, launched a year ago by UN Environment. The global campaign aims to eliminate by 2022 the main sources of marine debris, which can remain in ecosystems for 500 years. There are five identified ‘islands’ of plastic rubbish in the Pacific, Atlantic and Indian Oceans, one of them between Chile and Peru. “We have witnessed firsthand the serious impacts of different types of waste, including plastic in our seas,” said Ursula Carrascal, project coordinator for the Institute for the Protection of the Environment Vida in Peru. For 20 years, the organisation has been leading a campaign to clean up beaches and coastlines in this Andean country, involving all sectors of society. According to Carrascal, the problem is exacerbated when the country suffers additional damage caused by natural disasters, such as the “La Niña” phenomenon that in 2017 caused flooding and the shifting of tons of waste accumulated on river banks. 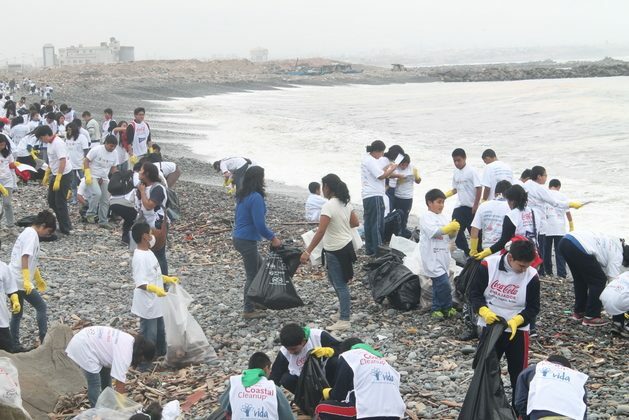 “Marquez Beach in Callao was literally covered in garbage for three km. Many beaches are now gone, fishing boats and artisanal fishermen are affected by the damage to their nets or engines caused by plastic,” she told IPS from Lima. The country, according to the Environment Ministry, generates 6.8 million tons of solid waste. Lima and the neighbouring port city of Callao alone generate an estimated three million tons per year. Of that total, 53 percent is organic waste, and in second place comes plastic, accounting for 11 percent, a percentage in line with the world average. In fact, half of the 6,000 tons of marine debris collected by Vida since 1998, with the support of 200,000 volunteers, is plastic. “There is a strong concern about the risk in the field of food safety due to the plastic accidentally ingested by fish,” Carrascal said. The governmental Marine Institute of Peru has been studying the impact of microplastic (less than five mm long) on Peruvian beaches and in the digestive tract of fish for years. A 2017 report found 473 plastic fragments per square metre on a beach in Callao. The British Ellen MacArthur Foundation, dedicated to promoting the circular economy – based on the reduction of both new materials and waste, to create loops of recycling – warns that by 2050 there will be more plastic than fish in the oceans and reminds us that all marine life eats this waste. One of the consequences, say scientists at Ghent University in Belgium, is that when you eat fish and seafood, you ingest up to 11,000 tiny pieces of plastic, a material most commonly derived from petrochemicals, every year. In Brazil, a country with more than 9,000 km of coastline on the Atlantic Ocean, a marine aquarium was inaugurated in October 2016 in Rio de Janeiro. AquaRío, which promotes environmental education and scientific research for biodiversity conservation, is the institution with which the Clean Seas campaign was launched. “Plastic discarded improperly on beaches, rivers and the sewers ends up in the sea and causes the death of thousands of marine animals every year. 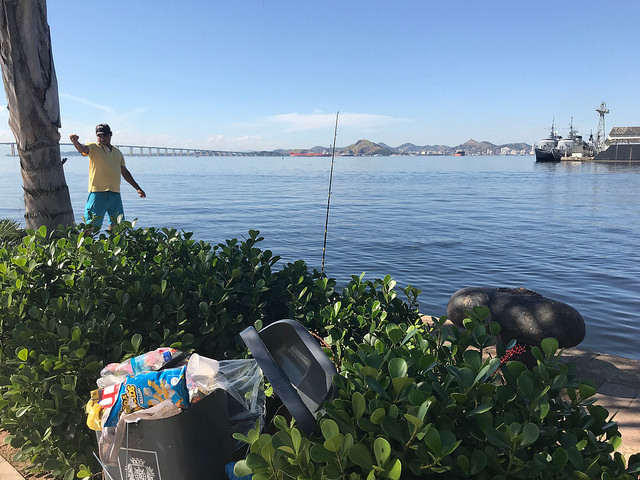 Drinking straws, cigarette butts, caps, plastic bags, improperly discarded, represent the highest percentage of environmentally hazardous materials for marine wildlife,” director Marcelo Szpilman told IPS. “The remains of nets, fishing lines, ropes and plastic bags abandoned in the sea remain in the environment for many years due to their low biodegradability and end up injuring or killing countless animals that end up entangled and die by asphyxiation or starvation,” added the marine biologist. To raise awareness among children about this silent killing at sea, the aquarium uses the image of mermaids dying from the ingestion of plastic. This happens in reality in the oceans to fish, birds, seals, turtles and dolphins that confuse floating plastic waste with octopuses, squid, jellyfish and other species that they eat. “Dolphins have been found with their stomachs full of city trash. Cigarette butts, the most widely collected item in all beach clean-up campaigns, have caused the death of animals that swallow them mistaking them for fish eggs,” Szpilman said. In addition, he noted, “a plastic bag drifting at sea is easily mistaken for a jellyfish, which is a food for several species of sea turtles, which as a result can die from asphyxiation. According to experts, in Brazil and other Latin American countries, the problem is combated with isolated initiatives, such as the banning of plastic bags in supermarkets, when what is needed is a broader change in the model of plastic production and consumption. But some things have started to be done. In Peru, for example, Vida has coordinated actions with the waste management industry to promote the circular economy model through recycling chains with the waste collected in coastal cleanups throughout the country. This work has been carried out not only with large industry but also with small and medium-sized enterprises and the National Movement of Recyclers of Peru. “Greater efforts and investment in recycling technology are needed to solve the plastic problem. In Peru, much of the plastic waste collected, although it could be 100 percent recycled, is not recycled because there are no recycling plants, due to lack of knowledge or lack of adequate technology,” Carrascal said. The Peruvian model of waste management in the marine ecosystem has been used as a reference point in other countries of the Southeast Pacific, including Chile, Ecuador, Colombia and Panama.